When Itsuro Saika was young,he studied with the poet,litterateur,and painter Ikutada Hayakawa and the sculptor Shindo Tsuji. As a result , he continued writing Japanese waka poetry into his old age. 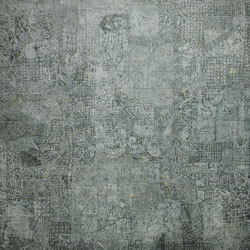 In his other line of activity as a painter , he employed unique,original techniques to apply alternating, overlapping layers of pencil, Gofun(paint powder made from sea shells),and chalk to thick washi (handmade paper),resulting in a series of deep emotional landscapes that construct a representational world of abundant intelligence. 1928 born in Tottori prefecture. 1944 begins studying with poet and litterateur and sculptor at age 16.
the Shirota Gallery, the Ochanomizu Gallery, and the Koshindo Gallery. 1977 Kuro(Black), a book showcasing his works published by Chusekisha. 1955 Exhibition “Itsuro Saika:Between White and Pure White” at Yonago City Museum of Art. 2007 Died in June 19. Group exhibition:”A Labyrinth of Lines”, at Meguro Museum of Art, Tokyo. 2009 “An Exhibit od the works of Itsuro Saika”,Fujisawa Civic Art Gallery.